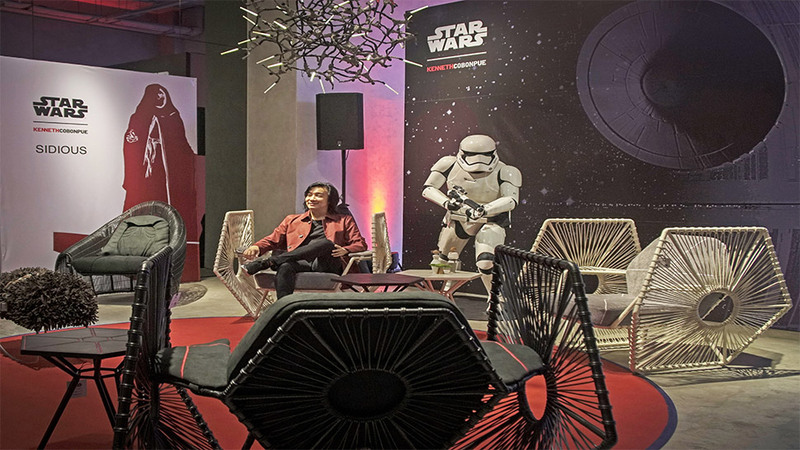 Earlier this year, during the AsiaPOP Comicon, Star Wars fans were given amazing news when Disney revealed its collaboration with internationally renowned Filipino furniture designer Kenneth Cobonpue to create a collection of furniture inspired by the Star Wars franchise. Months later, the collection has finally been launched—and we are in awe of the pieces it comprises. During the official launch at his Greenbelt, Makati store on October 10th, Kenneth talked about the different pieces in the collection, which include armchairs, a rocking stool, a lamp, and miniature figurines. The excitement was evident in his face as he shared information about the pieces, which truly echo not only his impeccable technique but even his extensive knowledge of the Star Wars universe. 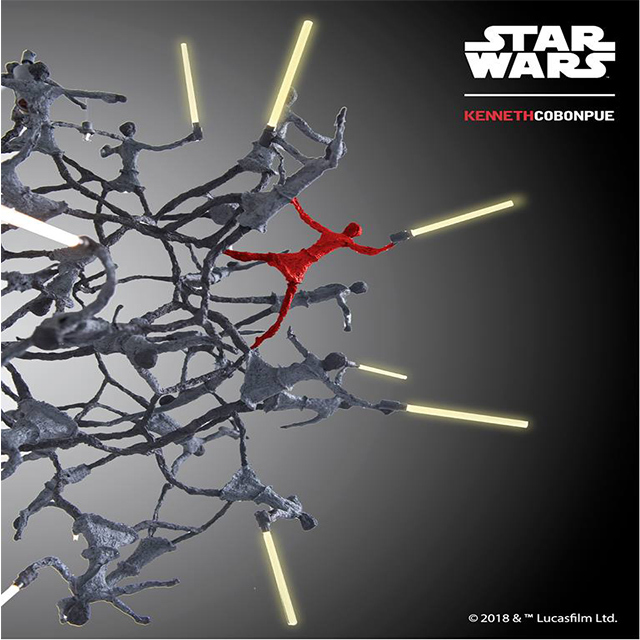 Here is everything you need to know about the #StarWarsxKennethCobonpue collection. Right away, any Star Wars fan will identify this piece to be reminiscent of the TIE fighters, which were the symbol of the Imperial fleet. Kenneth, a self-confessed fan of the franchise, shared that this was the first piece he designed, out of his childhood dream of being a fighter pilot. We’re sure that sitting on that stunning chair will make us feel like we’re on a TIE fighter, flying through space and combating starfighters. 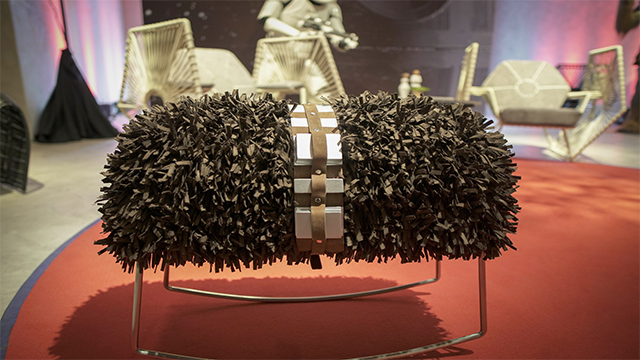 Inspired by one of the most distinct characters in the Star Wars universe, the Chewie rocking stool is made of Italian microfiber and features a leather strap, which looks just like Chewbacca’s signature bandolier. Sitting on this stool will make anyone feel like they’re with the famous Wookiee warrior! If you are a Star Wars fan and are looking for a cool new piece to light up your space, there is no need to look further. The Star Wars collection features a Jedi Hanging Lamp, which is made of 44 little handcrafted jedi welded together and holding LED lightsabers. If you look closer, you’ll also see one sole red figure, representing the Sith Lord that the jedi are fighting against. 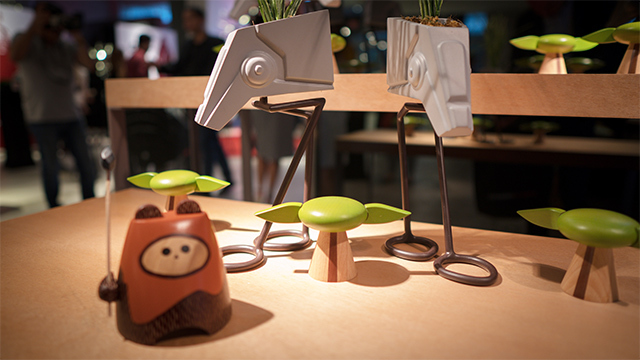 This new lamp is a take-off from his classic Little People lamp, which was launched several years ago. 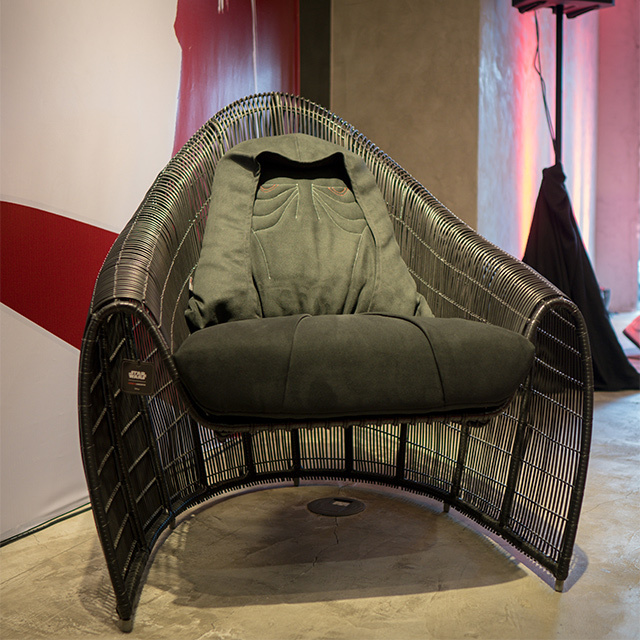 The Sidious armchair, inspired by the powerful and manipulative Darth Sidious, features a form and silhouette that is both sinister and fluid. Just looking at this piece will make you feel like you are looking right into the terrifying, scheming eyes of Emperor Palpatine himself. 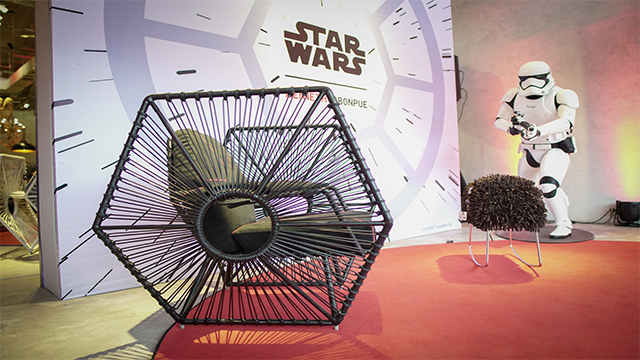 Last but definitely not the least is the armchair inspired by the mysterious Darth Vader. Not only does it exude an ominous air; it also looks very luxurious. With its swivelling, foldable table, you can use this chair to have a bit of privacy, and do your work—perhaps taking the time to ponder on how to crush the Rebel Alliance and enforce the Emperor’s will. 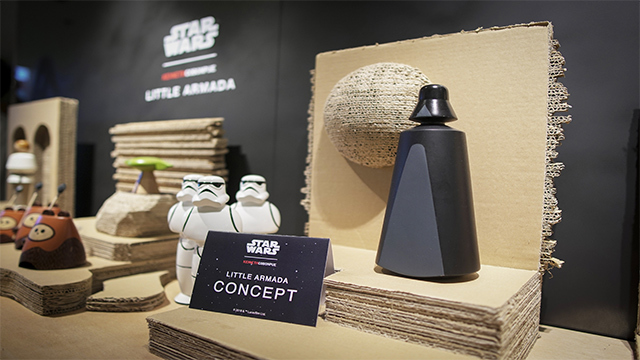 Another interesting part of the exhibit is the line of little wooden figurines called Little Armada, which resemble notable Star Wars characters such as Princess Leia, Han Solo, and Yoda. Kenneth shared that the collection will hopefully be released in the following month, and we seriously hope so. Who wouldn’t want to have a little bit of the Star Wars universe inside their own homes? “Designing these things is like a return to my childhood,” Kenneth shared during the launch. And truly, experiencing the extraordinary pieces in the collection feels like a reconnection to the galaxy far, far away. 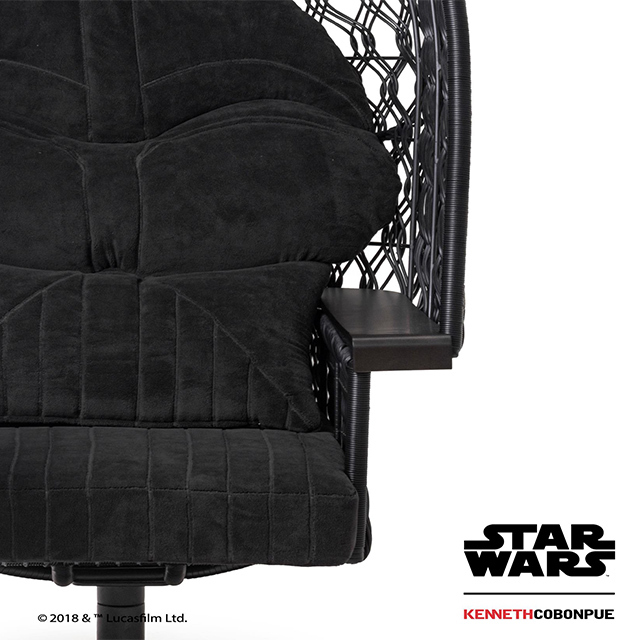 So before you watch the entire movie franchise all over again, get your hands on the #StarWarsxKennethCobonpue furniture collection while you can!